Praying 2 rakaats for ihram? Is is permissible to take pills to stop period during hajj/umrah? In the state of Ihram, the man should leave his feet uncovered so that the bones on the upper part of the feet are left exposed. He should not wear sandals that cover the upper part. Using a sleeping bag is merely a means of keeping oneself warm; it is not a part of clothing as such. Therefore he can use it in extreme weather. 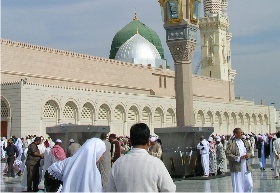 The head and face of a man should be left exposed at all times during the Ihram state.